Follow me as I get creative with food! When my husband and I were invited to a wine tasting party, the first thing that came to mind to bring was roasted nuts. I got this recipe from a friend years ago but have never actually made it. 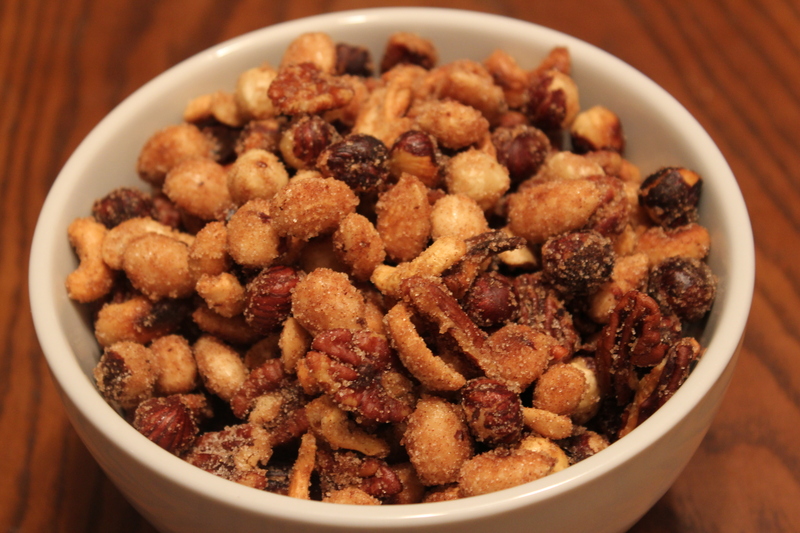 I used an assortment of nuts that I enjoy, but you could use any combination or single kind. The pecans in this recipe are my personal favourite because they caramelize so well, but I think they are too expensive to use alone. Make sure you are buying only unroasted, unsalted nuts otherwise this recipe will not work. Having finally made this, there’s a few variations I’ve developed that I’d like to try: my husband has already requested a ‘spicy’ version. 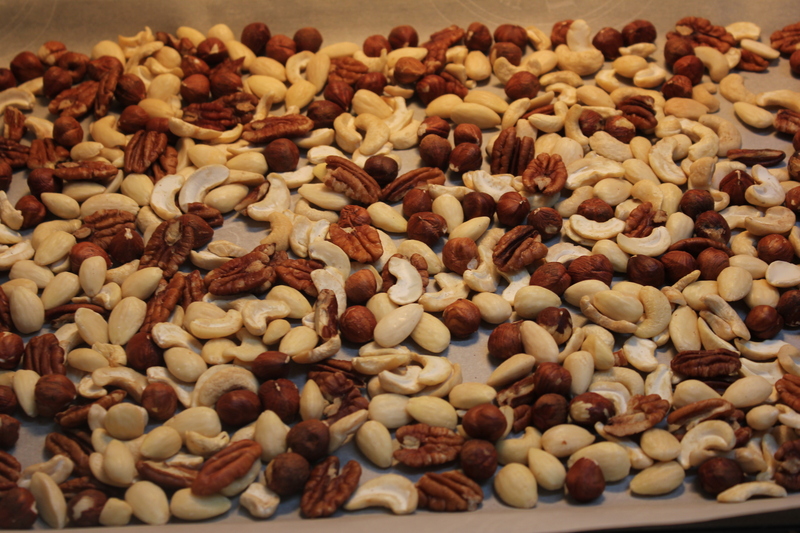 Spread the nuts on a parchment lined baking sheet and toast them in the oven at 350 F for around 10 -15 minutes. Watch them and make sure they don’t burn, they get softer when they are toasted. While your nuts are roasting, combine the sugar, salt, ginger and cinnamon in a large bowl and set aside. In a large pot or saucepan, heat the oil and honey then add the nuts to the pot. Stir the nuts well to coat them in the honey mixture and continue stirring until all the liquid has evaporated (there is none at the bottom of the pot and all the nuts are coated). 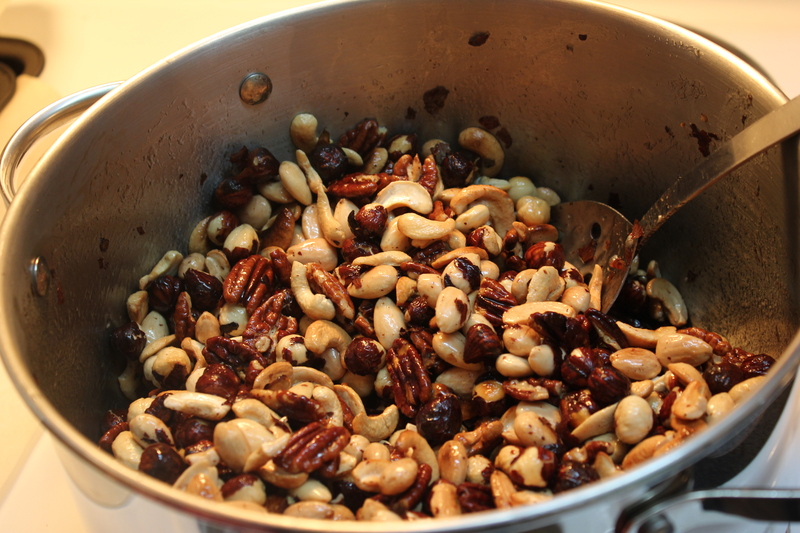 Immediately pour the nuts into the sugar mixture and toss them to ensure they are coated evenly. Finally, spread them on a cookie sheet to cool. These actually taste better once they’ve fully cooled and all the flavours have had time to come together.